A discussion venue about the role (and misrule) of big government and high taxes. Also a second website of Minimal Government Thinkers. I found this news report a twist -- the PCCI, Ateneo, San Beda, RDC question the retail competition and open access (RCOA) provision of EPIRA. I thought people hate monopolies, like Meralco and the roughly 120 other electric cooperatives nationwide. RCOA gives people and large consumers the choice to opt out of those area franchise monopolies. "The RCOA makes it mandatory for big power consumers to source their electricity supply from licensed RES. Resolution No. 10 adopts the revised rules on what is a “contestable customer” or those who are required to source power from a RES." So big, contestable consumers can no longer stay with their DUs, they must find a retail electricity supplier (RES)? This is reverse coercion. "Meralco asked for a temporary restraining order and/or writ of preliminary injunction against ERC Resolution 5, which was issued on March 8, 2016, as well as Resolutions 10 and 11..."
Sabagay, why a deadline? If a big or medium-size consumer cannot find an RES yet, DOE and ERC will penalize it? Can they do that to non-energy players like a hotel, a mall or hospital? * This is my article in BusinessWorld last January 17, 2017. An excise tax is defined by the Department of Finance (DoF) as “a tax on products that have a negative effect on health or the environment... on nonessentials and luxury items.” With this definition, the DoF therefore, should abolish the tax on oil products, not increase it. Here also are the 10 myths and alibi why the DoF and other sectors tend to demonize oil and are proposing oil tax to be as high as possible. OIL IS BAD FOR THE ENVIRONMENT. Truth: Transportation of people and goods via cars, jeepneys, buses, and trucks that use oil is good for the environment because there will be no need for millions of cows, carabaos, or horses that produce tons of animal manure on the roads daily. Sure, there are particulates and other polluting gases but they are minor compared to tons of animal manure everywhere, more dirt, flies and worms in the environment. Also, cheaper LPG will encourage poor households to stop using firewood and charcoal for cooking which will result in more trees being saved. OIL IS BAD FOR PEOPLE’S HEALTH. Truth: Cars, vans, jeepneys, and buses that use oil spare the oldies, sick, babies, pregnant women, etc. of hard labor and more diseases due to exposure to heat, rains, dust, and exhaustion if they were to ride bicycles or skateboards or animals that do not use oil. Also, transport of agricultural products from Ilocos, Cordillera, Cagayan Valley, or Bicol to Manila via animals not trucks will only lead to food spoilage. People will have little or no access to fresh vegetables and fruits, resulting in poor health. OIL IS NOT A PUBLIC GOOD. Truth: Oil is a public good. As shown above, no petroleum, no modern and comfortable life, no mass production of food and transportation of people and goods. Public goods like public education, public health care, roads, bridges, etc. are either provided to the people for free or highly subsidized prices. Oil as a public good only needs zero tax, or at least low tax. MORE CO2 EMISSION FROM OIL MEANS MORE POLLUTION, MORE “MAN-MADE” CLIMATE CHANGE. Truth: CO2 is not a pollutant gas; it is a useful gas. It is the gas that humans exhale, the gas that our pets and farm animals exhale, the gas that plants use to produce their own food via photosynthesis. 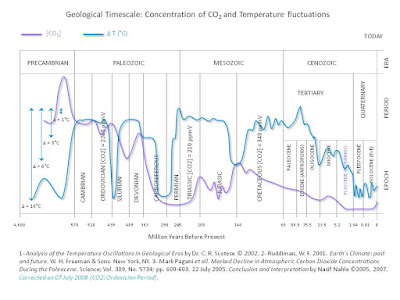 Climate change is natural and cyclical. Planet Earth is 4.6B years old, there was climate change ever since marked by warming and cooling cycles. INCREASING THE OIL TAX IS NECESSARY TO FINANCE MORE PUBLIC INFRASTRUCTURE. Government simply has too many personnel, officials, employees, consultants and pensioners; too many offices, travels, trainings, and meetings. Perhaps these items alone constitute about 70%-80% of the annual budget. So little is left for public infra, school buildings, government hospitals, etc. THE OIL TAX INCREASE WILL HAVE MINIMAL IMPACT ON THE POOR. Truth: Oil is used by the poor not only in jeepneys but also in tricycles, farm tractors and harvesters, irrigation pumps, fishing boats, interisland boats, generator sets in off-grid islands. While the DoF plans to introduce “Pantawid Pasada” for jeepneys, nothing has been allotted for farm tractors and other equipment used by poorer farmers, fisherfolks, hunters, etc. 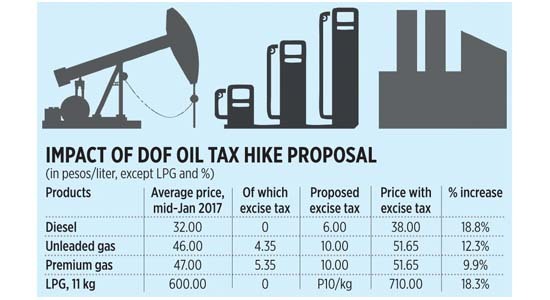 As shown below, fishing boats that use gasoline, tractors and irrigation pumps that use diesel, tricycles that also use gasoline, will be slapped with 12%-19% price hike simply because of the proposed tax hike (see table). THE OIL TAX INCREASE WILL HIT THE RICH MORE THAN THE POOR. Truth: Oil use is a small portion of the overall consumption of the rich. The rich buy more expensive but more fuel-efficient cars and SUVs, they spend more on expensive restaurants, hotels, schools and universities, condos and subdivisions, etc. FOOD PRICES WILL NOT GO UP SIGNIFICANTLY WITH OIL TAX HIKE. As mentioned above, oil is used not only by trucks, jeeps, and boats that transport agriculture, meat and fishery products. Oil is also used by farm tractors and harvesters, fishing boats. A 3.6% food inflation in 2016 (despite around 50% hike in diesel prices) is not small for the poor. NO OR LOW EXCISE TAX MEANS SUBSIDIZING THE OIL CONSUMPTION OF THE MIDDLE CLASS AND RICH. Truth: There is no subsidy, zero, unlike subsidies for public education and health care or rice price subsidies using tax money. When you walk down the street and encounter a mugger who didn’t demand your money, you do not owe that mugger anything. GOVERNMENT IS LOSING SOME P145 BILLION/YEAR POTENTIAL OIL TAX REVENUES. Truth: Government has no entitlement to more income and savings of the people other than income taxes that are already high, and other existing taxes. Government is losing more from wasteful spending or stolen money via corruption. Government can save more money for infrastructure by reducing too many personnel and consultants and by abolishing and defunding old welfare programs that do not work before it creates new welfare programs. Bienvenido S. Oplas, Jr. is the head of Minimal Government Thinkers and a Fellow of SEANET. Both are members of Economic Freedom Network (EFN) Asia. Socialists and trying-hard anti-capitalism ideologues in facebook, youtube, etc. who also severely enjoy facebook capitalism, youtube capitalism, keep harping about "man-made" warming/climate change (CC) and thus, demand more government and UN ecological + energy central planning. Like this report posted by Arcy Garcia. As usual, palusot pero hindi lusot. Why? 1. No charts of temperature anomaly, only sketches and drawings. 2. Title is 4.5 B years, fine, but the sketches start only in past 20,000 years. 3. 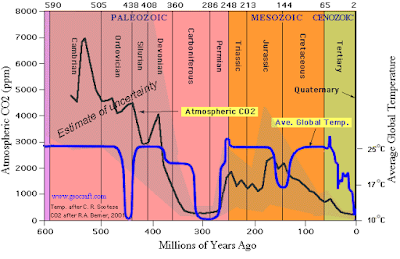 "Earth's warming at unprecented levels", no chart or table to show; unprecedented, no precedent? Scam statement. (1) Planet Earth is 4.6 B years old, when, what period that there was no CC? (2) What was it before this "man-made" CC -- less rain, no rain, more rains? less flood, no flood, more flood? less snow, no snow, more snow? Less dogs, no dog, more dogs? 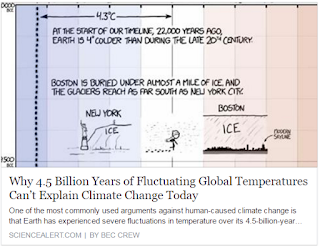 And for the nth time, Arcy and all climate evangelists have no answer. No climate alarmist has ever answered those questions honestly. 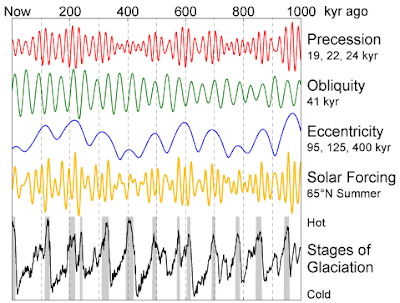 Some paleo-climate data showing warming-cooling cycle in the past. 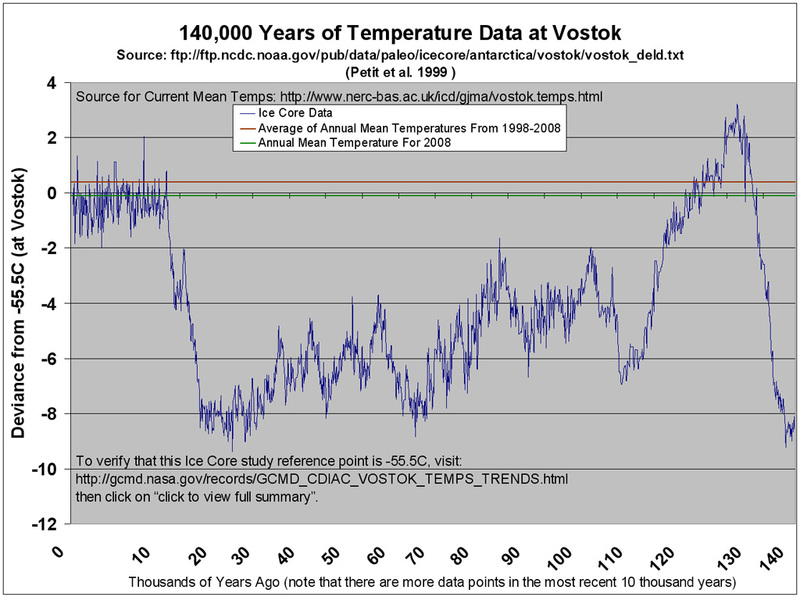 The climate alarmists close their eyes if the data do not support their "man-made" CC religion. 140k years ago. 1 million years data. These guys have faith, strong faith in the words of Al Gore and the UN. 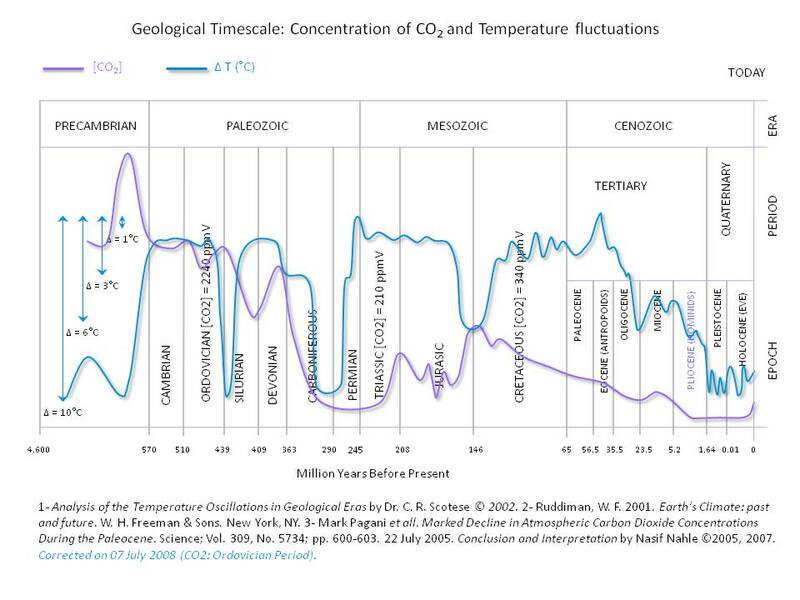 Finally, here's the 4.6 B years timescale. Warming-cooling, endless natural cycle. 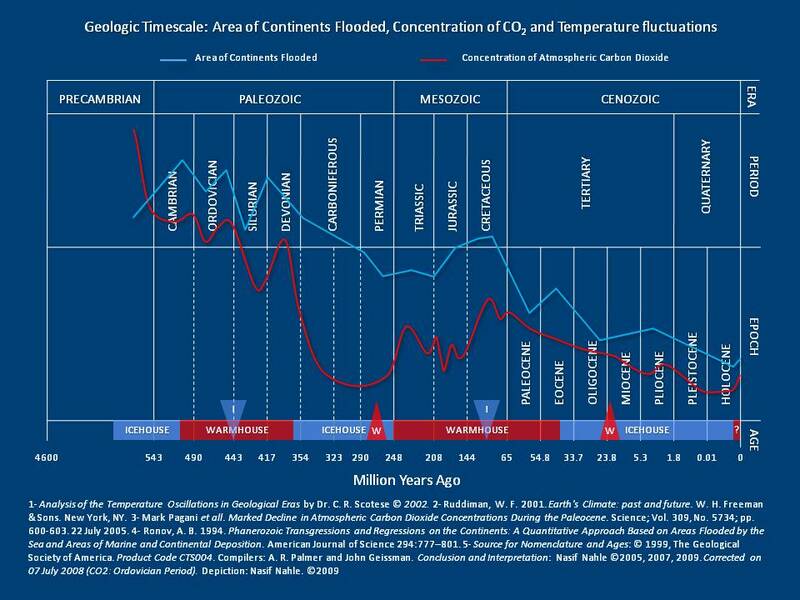 See more data here, https://wattsupwiththat.com/paleoclimate/. 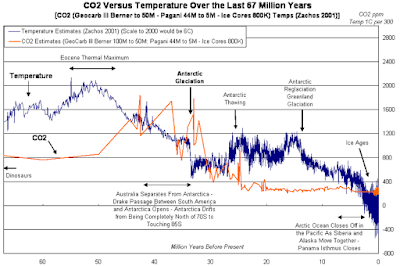 What the data and charts above show is that even if 100% of all power plants in the world are from fossil fuels, global cooling will still happen. And even if 100% of all energy in the planet is from hydro, wind, other renewables, global warming will still happen. 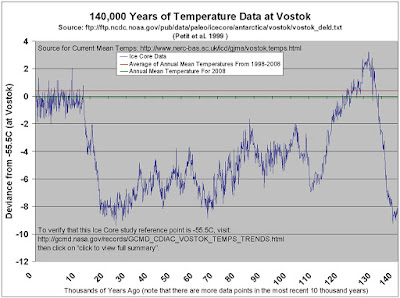 But then religionists and climate evangelists will always have zero appreciation for data. Only faith, strong faith in the words of Al Gore and UN bible. Why? Money, money, money. Hypocrisy-robbery. Huge extortion racket, via governments, the UN and other multilaterals. (e) both have ageing population, so both would need an infusion of young migrant labor from the PH, today or tomorrow. (f) Both have huge, big governments that are heavily indebted (220%+ of GDP for Japan, 40%+ for China but if the debt of their state corporations and banks, local governments, private corporations are included, about 240% of GDP). So both will need the money of middle class and rich Filipino tourists who can afford to travel to more countries around the world. * This is my article in BusinessWorld last January 12, 2017. Taking off from the paper by a friend and fellow columnist Romy Bernardo’s “Wishes for the economy in 2017” last Monday, this paper will make some raw projections of GDP size until 2026. The base document is the IMF’s World Economic Outlook (WEO), October 2016 database. In the table below, GDP size is based on purchasing power parity (PPP) values, not nominal or current values. Actual data for 2006, 2016, and 2021 are IMF projections. Now this paper will take a longer but very raw view by projecting potential GDP size by 2026. Here is the raw and crude methodology. (a) Take the GDP multiple or expansion from 2026 to 2021 per country, call it Y. 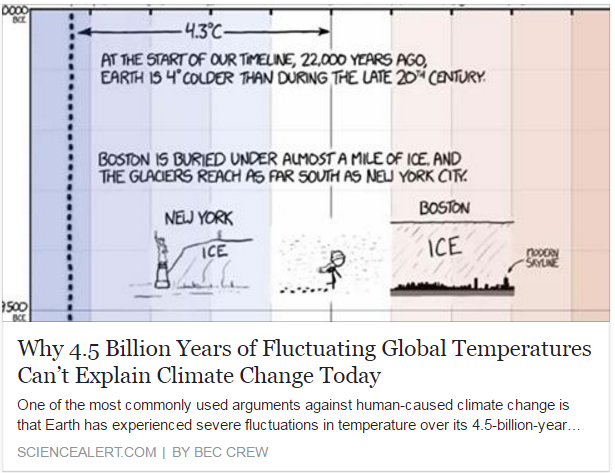 (b) Assume that the same degree of expansion will occur from 2021 to 2026. (c) GDP 2026 = GDP 2021 x (1 x Y). Readers with more advanced data and econometric tools will scoff at this raw methodology but please understand that this is just an attempt and the limitations of the assumption have been stated. So here is what we can project in the next few years. From this table, we can summarize important projections for selected Asian economies. 1. In 2016, four Asian countries would remain in the 10 largest economies in the world: China, India, Japan, and Indonesia. 2. Six of the 10 ASEAN countries would belong to the Top 40 largest economies in the world in 2016: Indonesia, Thailand, Malaysia, Philippines, Vietnam and Singapore. 3. By 2021, Indonesia will overtake Brazil in the seventh spot and will be in a striking distance to dislodge Russia in the sixth spot. 4. Also by 2021, the Philippines will rise to the 26th spot and Malaysia will rise to the 27th spot, overtaking Argentina and Netherlands. Malaysia and the Philippines will also belong to the club of trillion-dollar economies by around 2018 or 2019. 5. Vietnam will rise from its 36th spot in 2016 to 33rd or 32nd in 2021, overtaking UA Emirates, Algeria, and Iraq, and possibly South Africa. 6. 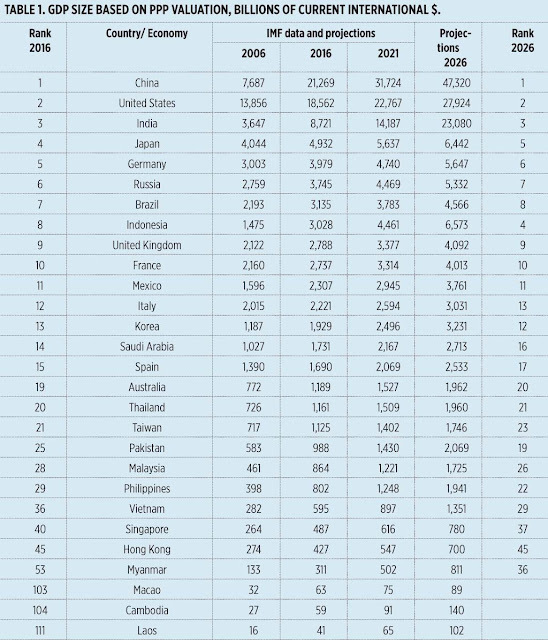 By 2026, assuming that the raw projections will somehow hold, the combined size of China and India will be larger than the combined economies of US, Japan, Germany, Russia, Brazil, UK, France, Mexico, and Italy. 7. 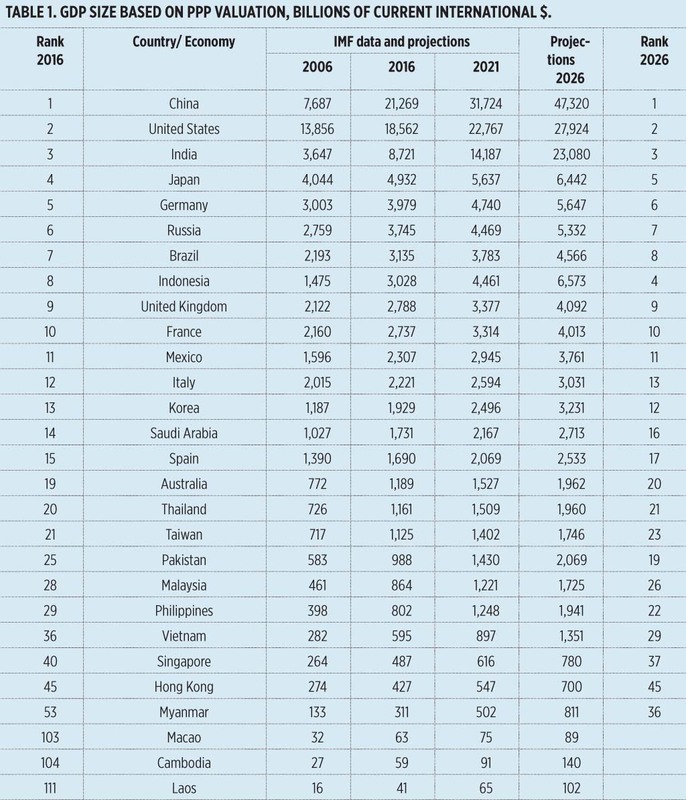 Also by 2026, Indonesia will become the 5th largest economy in the world, overtaking Japan, Germany, Russia, and Brazil. 8. And the Philippines will rise to the 22nd spot, further overtaking Taiwan, Nigeria, and Poland. It will also be in a striking distance to overtake Thailand and Australia by then. 9. Pakistan and Vietnam, also having big and young population like India, Indonesia, and Philippines, will also significantly expand their economic sizes and improve their ranking. 10. While Japan is expanding marginally, South Korea will sustain its growth. Now, a collapse of North Korea (possible within the next six to eight years) and unification of the two Koreas will possibly make them overtake France in the #10 spot. Many things will happen in the coming years so those IMF projections for 2021 and the assumptions made in this paper for 2026 can be considered as suggestions with some material basis. We still take actual numbers as they become available as basis for policy reforms. Other Asian governments should take lessons from the experience of Europe and Japan: an ageing population will be a drag in further economic expansion. Policies that control population or heavily restrict migration are wrong, as wrong as trade protectionism, heavy taxation, and stifling business regulations. Governments should avoid these policies. 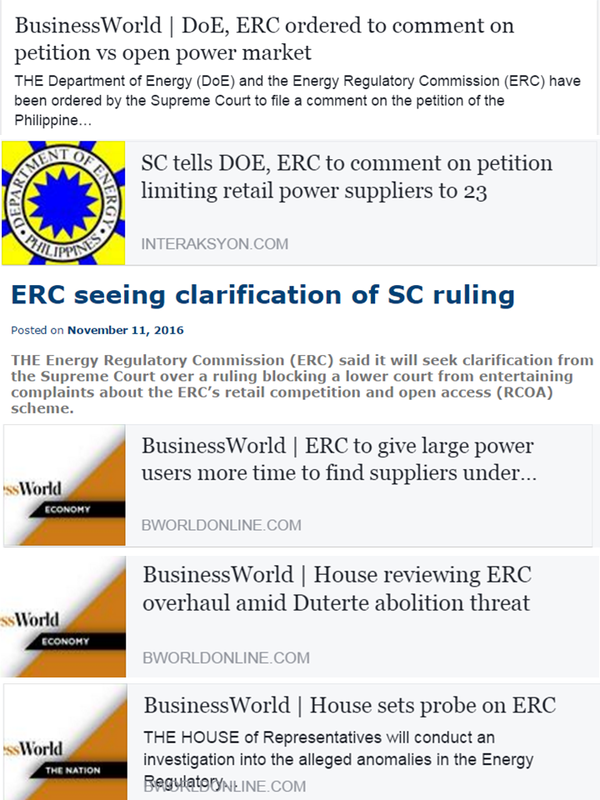 These are some news reports and my brief notes last January 11-12, 2017, posted in my fb wall. That's huge. Tax competition, not tax harmonization, is the way towards higher global growth. "When I walk down the street, and a mugger ... doesn't take my wallet, he didn't give me my wallet," Norquist analogized. "This idea when the government fails to steal your money ... and tax it, that it gave it to you is nonsense. It's not a gift." Now, what if the budget deficit balloons? Mr. Trump has a foul mouth but in terms of climate and energy policies, he is a realist, not alarmist. Now the world should begin to realize that climate change is mainly nature-made, not man-made. 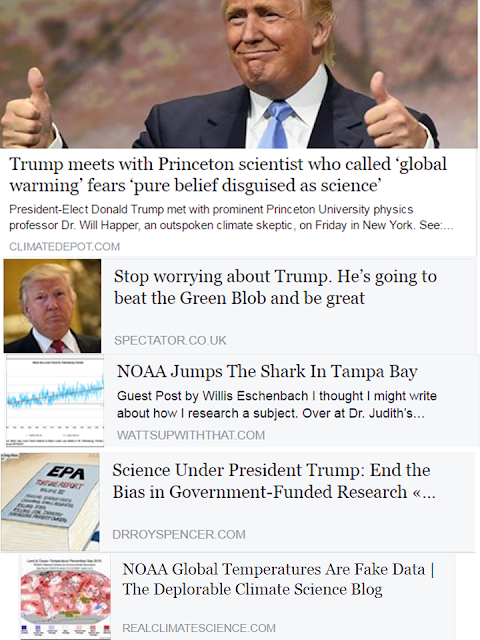 "good news, looks like my friend Will Happer is one step closer to being Trump's Science Advisor." Will is familiar with government service and the press, he will play by the rules. Definitely not a loose cannon." again, we are just reading between the lines here. He has not yet been offered the position. John alerted me to the new article, and I believe it's the second "trial balloon" that has been floated with his name." There were 2 other GOP candidates who were skeptic of "man-made" CC, Ted Cruz and Marco Rubio. But I doubt if pushed to the wall, they will challenge the climate establishment heads on. Seems that only Trump has the ball to take the huge climate alarmism establishment. Roy W. Spencer I agree. No one else would dare challenge the orthodoxy. 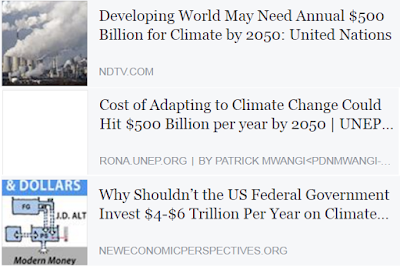 Too many powerful people invested in green schemes. Todd Foster "John Christy is being floated to head NOAA..." Will I ever get tired of such win. And that's Trump's biggest asset. His complete inability to be cowed by a media that fewer and fewer even trust. Yes, he'll take a beating from the howling monkeys of the press but he'll just keep pushing on, to higher approval ratings. Wow, Dr. Spencer commented on my wall, haha, was so happy. I have heard him first in 2009 in NYC, 2nd ICCC by the Heartland Institute. Since I was not so familiar with the highly technical aspects of climate science that time, was struggling with a very steep learning curve right there at the conference, I did not fully comprehend his talk and discussion about positive vs. negative cloud feedbacks to more CO2 added to the atmosphere, related topics. That conference was a start for me to read more about the technical aspects of climate science. I was visiting his blog, WUWT, others more regularly. 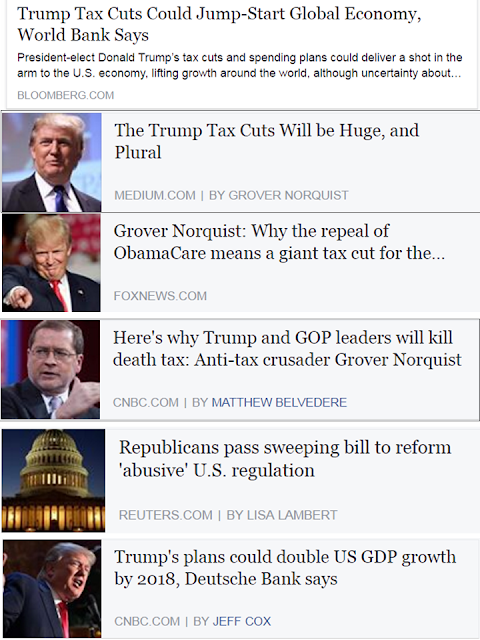 More articles here. This one is from new friend in fb, Willis Eschenbach. I think Willis was also present in the 2 ICCCs that I have attended, but I did not know him then. "These NOAA claims of wildly accelerating rates of sea level rise are not science in any form. They are government sponsored hysteria, and whoever did this at NOAA should resign. "In my opinion, we are an over-regulated society. Over-regulation not only destroys prosperity and jobs, it ends up killing people. And political pressures in government to perform scientific research that favors biased policy outcomes is part of the problem. Science is being misused, prostituted if you wish. * This is my article in BusinessWorld last January 6, 2017. 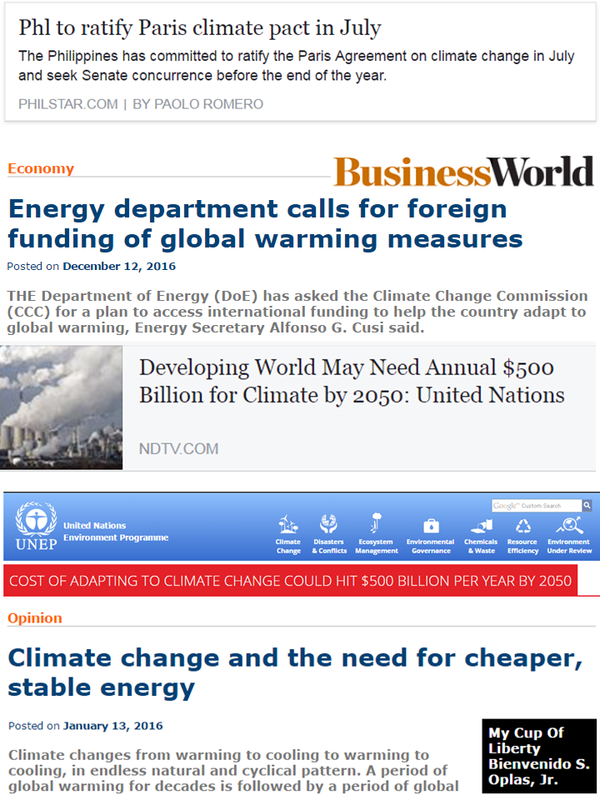 Here is my list of 5 international and 5 national or Philippine important energy issues last year. 1. Donald Trump and his energy policies. So far some of Mr. Trump’s Cabinet Secretaries are his fellow skeptics of the anthropogenic or “man-made” climate change claim (climate change is largely cyclical and natural or “nature-made”), or simply pro-oil. These include: (a) Environmental Protection Agency (EPA) head is Scott Pruitt, former attorney general of Oklahoma; (b) DoE Secretary is former Texas Governor Rick Perry who is pro-drilling; and (c) Secretary of State is Rex Tillerson, CEO of the oil giant Exxon Mobil Corp.
2. OPEC cut on oil production. For eight years, OPEC never cut its oil production despite declining oil prices to protect its global market share under intense pressure from huge shale oil supply from the US. In November 2016, OPEC finally blinked and decided to cut their collective oil output by 1.2 million barrels per day (mbpd) hoping for an increase in oil prices. Non-OPEC countries like Russia and Mexico made an agreement with OPEC to cut output by another 0.56 mbpd, for a total projected output cutback of about 1.8 mbpd. So far, price impact was marginal as oil prices before this OPEC decision was already touching $50 a barrel. But once US shale oil output ramps up, this marginal price increase can easily be reversed. 3. 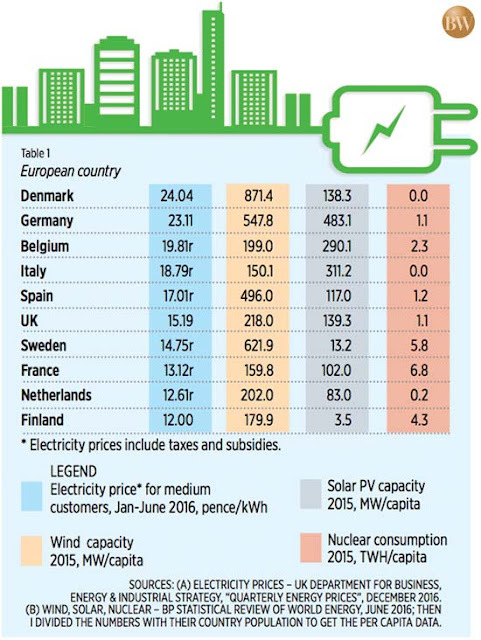 More wind-solar means more expensive electricity in selected countries in Europe. The numbers below show that countries with expensive electricity (1-5) have zero or little nuclear power, have high wind power (except Belgium and Italy), and high solar capacity (except Spain). And cheaper electricity countries (6-10) have high nuclear power (except UK and Netherlands) and low wind (except Sweden), low solar capacity (see Table 1). 4. 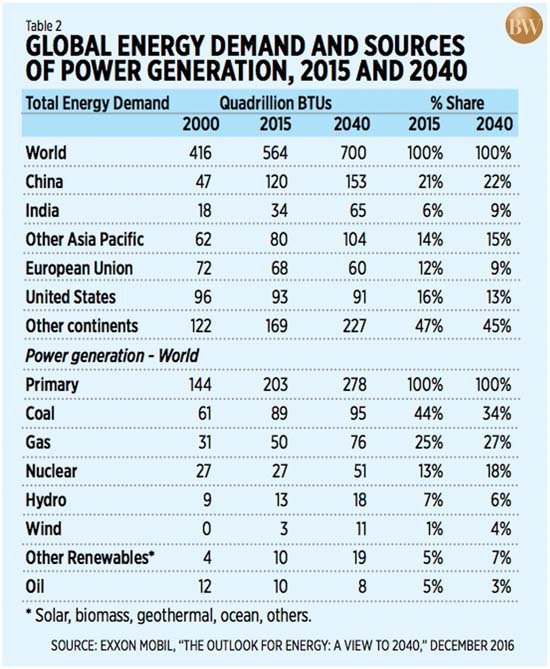 By 2040, 46% of global energy demand will come from Asia Pacific. Based on a recent report by Exxon Mobil which grabbed global energy headlines, it said that it expects China, India, and the rest of Asia Pacific (including Japan, ASEAN, and Australia) will increase its global share of total energy demand from 234 quadrillion British thermal units (BTUS) in 2015 to 322 quadrillion BTUs by 2040. The percentage share of the region will rise from 41% of global demand in 2015 to 46% by 2040. In contrast, the share of EU and the US combined will shrink from 28% in 2015 to only 22% by 2040 (see Table 2). 5. By 2040, wind, solar, biomass, other renewables will contribute only 11% of total global power generation. Coal will remain the dominant source in power generation worldwide by 2040 but its share will decline from 44% in 2015 to 34% by 2040. The share of natural gas and nuclear power combined will increase from 38% in 2015 to 45% by 2040. The share of wind, solar, geothermal and other renewables will marginally increase from 6% in 2015 to 11% by 2040, despite all the political noise worldwide that these renewables will get “cheaper than coal” and attain “grid parity” with conventional sources like coal and natural gas. 6. Search for an Independent Market Operator (IMO) of WESM. In the last Congress, then Sen. Serge Osmeña, Chairman of the Senate Committee on Energy conducted a series of meetings until January 2016 about the absence of an IMO that is supposed to manage the Wholesale Electricity Spot Market (WESM). The Philippine Electricity Market Corporation (PEMC) as market operator of WESM remains weird because (a) PEMC Board is chaired by the DoE Secretary, many board members are government officials; (b) Even the supposed four independent directors plus consumer representative (5 total) are all appointed by the DoE Secretary; and (c) PEMC is regulated by the Energy Regulatory Commission (ERC), which is under the administrative control of the DoE Secretary, who chairs the PEMC that is regulated by ERC. Aside from issues on the new Market Management System (MMS) for WESM rules and the transition to a real IMO, the move to create a WESM in Mindanao via the Interim Mindanao Electricity Market (IMEM) is gaining ground. The Mindanao dispatch protocol will have to be spelled out in detail too. 8. Imposition of Renewable Portfolio Standards (RPS). In June 2016, the DoE issued a draft Department Circular (DC) on RPS, a provision in the RE Act of 2008 (RA 9513) that “requires electricity suppliers to source an agreed portion of their energy supply from eligible RE resources.” This RPS will result in more expensive electricity because wind, solar, biomass, and small hydro that are not given feed in tariff (FiT) privilege of guaranteed price for 20 years can demand higher price for their energy output because distribution utilities will have zero choice but buy from them otherwise the DoE will penalize them. The draft DC wanted an initial “2.15% to be applied to the total supply portfolio of the Mandated Participant in each grid.” When asked what will be the projected price implication of such policy, DoE and National Renewable Energy Board (NREB) officials answered that no study on price implications has been made yet. A weird proposal where proponents have no clear idea on the cost of implementation to energy consumers, the DC was shelved. 9. Shift in energy mix from energy source to system capability. During the administration of DoE Secretaries Petilla and Monsada, the DoE wanted an energy mix based on energy source or technology, 30-30-30-10 for coal-natural gas-RE-oil, respectively. This is highly distortionary because many REs are either seasonal (hydro can be baseload only during the rainy season, biomass can be baseload only if feedstock is available) or intermittent like wind and solar. New DoE Secretary Cusi changed the energy mix based on system capability: 70-20-10 for base load-mid merit-peaking plants, respectively. This is a more rational mixture. 10. Endless demand for expanded, higher feed in tariff (FiT). As more solar farms and wind farms are constructed nationwide, their developers and owners are lobbying hard for an expanded FiT 2 with guaranteed price for 20 years. Even geothermal developers also lobbied that their new plants should also be given FiT. Currently, three wind developers -- Trans-Asia Renewable Energy Corporation (TAREC), Alternergy Wind One Corporation (AWOC), and Petrowind Energy, Inc. (PWEI) are petitioning the ERC that their FiT rate be raised from P7.40/kWh to P7.93/kWh. 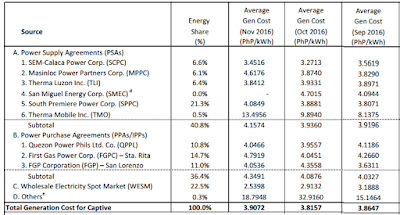 Three wind farms were lucky or favored to get P8.53/kWh under the original FiT -- EDC Burgos (Lopez group), Northern Luzon UPC Caparispisan (Ayala group) and Northwind Power Bangui (partly Ayala). "...As a people we should resolve to now be moving people, but we are moving private vehicles instead. Emergency powers are being readied to deal with the traffic crisis. Meantime, it's everyman and everywoman for himself. The answer to the mobiity crisis? Buy another car! This is to dodge the number coding restrictions. This is where political will is supposed to be needed. It is time for radical solutions, like Tony Oposa's idea of road sharing -- half of all lanes for motorists, half of them for pedestrians and cyclists. Or steep congestion pricing...."
"half of all lanes for motorists, half of them for pedestrians and cyclists." Lousy proposal sir. You mix cars and buses with bicycles and skateboards and pedestrians in one road? and if one wayward bus or car hits any of those bicycles, pedestrians, who's to blame, Oposa? the bus/car driver? the pedestrians? 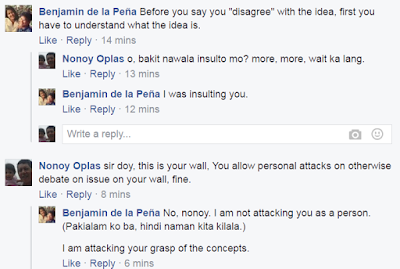 "Nonoy Oplas, that's a ridiculous comment. Who said anything about "mixing" - you build sidewalks, protected bike lanes, and transit only lanes." I replied to both: "precisely sir. Edsa is 6 lanes, 3 for cars/buses/trucks, 3 for bicycles, skateboards, pedestrians. There will always be impatient drivers on the motorists lane, especially on an emergency trip or night time, etc. and will sway to the 3 lanes of bicycles, etc. Accidents will happen there. Who's to blame, Oposa and supporters? 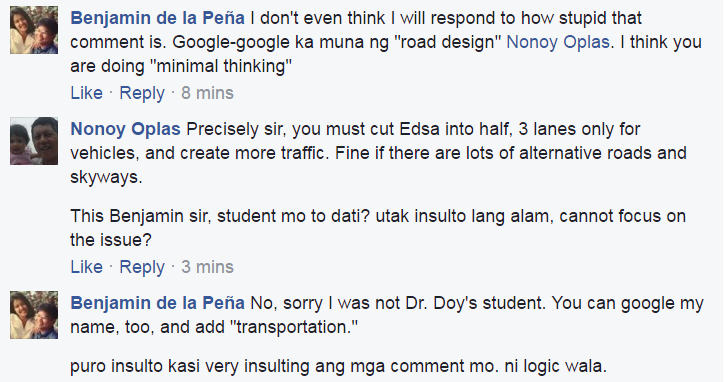 MMDA? drivers...? Benjamin, you build sidewalks in the middle of EDSA? hehehe"
Then see the succeeding comments of Benjamin, calling me as "minimal thinking" which for me is an insult. I am regularly engaged in a number of debates, past and present. I always make a distinction to criticize an idea or comment, not the person. Shoot the message, not the messenger. Like "that's a lousy idea" and not "Mr. X is lousy." Now see succeeding comments from this man. Explicitly saying that he was insulting me then claim later that he was not attacking me. Sir Doy said that "Benjie is one of our foremost Filipino urban and mobility specialists in the country." His fb profile says that he also graduated from UP, studied Urban Planning at Harvard U, lives in Miami, Florida. 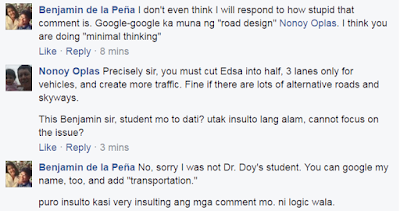 Fine, and if I criticize an idea -- mixing cars, buses, bicycles, pedestrians in Edsa -- he can personally insult or attack people who disagree with the idea? It speaks of his character. Meanwhile, back to the issue. I notice that many people are actually forced to drive their cars because of the inconvenience and some dangers of multiple rides. Take someone living in UP Village or Batasan Hills in QC, working in Buendia, Makati or BGC, Taguig. Four rides: (1) tricycle from house to Philcoa or Sandiganbayan/Commonwealth, (2) jeepney from there to MRT station in Quezon Avenue, (3) MRT to Buendia or Ayala station, (4) jeep to office in Buendia or bus to BGC. Four rides going to work, four rides going back home, 8 rides, daily. If one has to wear a formal corporate dress daily, or carrying a laptop, other important documents, or some big cash, it is very inconvenient to make those multiple transfers being exposed to street robbers, dust, heat, smog, or rain in between rides, the hassle of walking-waiting-standing between rides, etc. Because of this inconvenience of public transpo, many middle class and rich people are forced to drive their cars or motorcycles, or take Uber/Grab/taxi, which means more private vehicles on the road, more traffic congestion. Even if the most modern MRT trains are available tomorrow, many people will still avoid those multiple rides and will use their cars or motorcycles. One solution here would have been those air-con vans that act like school buses. Pick up passengers from the nearest points from their house, if not in front of their house, bring them to their offices in one convenient and comfortable ride. But LTFRB disallows this, they only allow point to point vans, which means people must walk or ride tricycles to the vans' terminal, then walk far or ride a jeep to their offices or final destinations, reverse the process going back home. Those aircon vans were market solutions to the traffic problem. No taxpayers money, no new government bureaucracies will be committed to provide such solution, just allow the van owners/operators and commuters to decide the dynamics such service in terms of pricing/fare, service quality and safety. This is not to say that I do not support the development of mass transport system, I support it. It's just that while it will take years if not decades to have a modern integrated transpo system, this house-to-office aircon vans transpo is the easiest, quickest, least distorting transpo solution to traffic congestion. The road-sharing as proposed by Oposa, et al? No. Children, babies, oldies, physically disabled, pregnant women, those carrying important and heavy luggage, should be riding in comfort as much as possible, not pedaling or skating or walking in Edsa and other major roads. Thus, these roads should not be constricted via forced "road sharing"
Benjamin posted this on twitter, bragging that he insulted me. Ahh, arrogant id___. Good that he lives in America, meaning one less arrogant soul in the Philippines. One disease of central planners is the tendency to be arrogant and "all-knowing" and their patience for contrary views is low. (1) It is saying that economists writing about plain economics are not relevant, so to make them relevant, they must write about economics + politics + sociology + anthropology + history + genderology + ...? (2) Consider a simple demand-supply price equilibrium theory. A big storm damaged crops in a major food producing region that substantially supplies food in M.Manila, so the supply goes down, the price goes up since demand remains the same. No need for politics, history, anthro, sociology, gender, etc. to inject into the analysis to make it relevant. Now comes politics, government imposes price control on food items supplied by other regions not affected by that big storm "to protect the poor." Things become awful, formal supply goes down, turns to "black market" supply. It is politics inserted into normal economic phenomena that distort things. And people think economists should always factor in politics, history, etc. in an otherwise simple situation. Lousy. 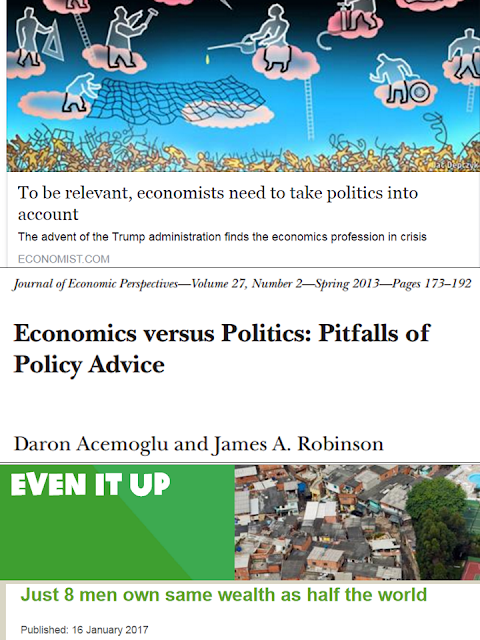 (3) Economists who comment on political issues -- politics around the world, political ramifications of federalism and parliamentarism, revamp of the constitution, etc. -- then they must insert politics, history, etc. in their analysis. 1. Mr. X and his friends demand a 500 GB USB that is sold for only P1,000. Demand is there but supply is zero, so market failure. 2. Mr. Y and his friends supply a rice variety that is said to cure 10 types of common diseases and sold at P800/kilo, no one buys their rice. Supply is there but demand is zero, so market failure. Anyone, anytime and anywhere can create a market failure, as shown by 2 examples above. Some guys like economists (and politicians, etc.) think they can stop or remove that? Wow. On inequality, it's part of nature, it's good. Otherwise people will work only few hours a day and demand that their pay, their house, healthcare, etc should be at least 1/5 that of the privileges enjoyed by Bill Gates and Henry Sy or John Gokongwei, etc. to have equality in society. The world has progressed because of respecting inequality, not forcing equality like socialist countries. Ok, the incomes and wealth of Bill Gates, Zuckerberg, etc. have expanded up to the troposphere, did they make people's lives, our lives, poorer and lousier? Do we have lousy and despicable lives because Zuckerberg got richer each year because of facebook? No. On the contrary, we enjoy more comfortable, more convenient lives because of the inventions of these super rich people. If people think that Zuckerberg et al are creating a more despicable world because of their inventions and companies, they better opt out of fb, youtube, google, iphone, etc because everytime they use those things, they contribute to further enrichment of these super super rich people. The only way to stop rising inequality is via dictatorship. Put a gun on people's heads and tell them to stop being too innovative, too inventive, too revolutionary in business, to stop and limit excellence. Central planners would clap this scenario. They get huge pay and various political perks doing all types of social engineering to force equality in the world. * This is my article in BusinessWorld last January 04, 2017. Global trade has significantly slowed down in 2015 which is ironic because it was the start of significant oil price declines. After recovering from the 2009-2010 global financial turmoil that started in the US, global exports reached $18.3 trillion in 2011, $19.0 trillion in 2014, but declined to $16.5 trillion in 2015. Nonetheless, there are some good news in Asian trade which battled this global trend in export decline. Below is my list of these positive developments. 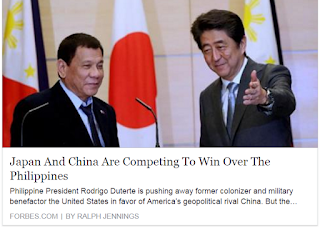 1 China, Vietnam, Hong Kong, and the Philippines did not follow this global trend. Their exports in 2015 were higher than their 2011 levels. For the Philippines, exports reached $58.6 billion in 2015, higher than 2011’s $48.3 billion. 2 Many Asian economies remain leading exporters and importers in merchandise or goods trade, led by China, Japan, South Korea, and Hong Kong. 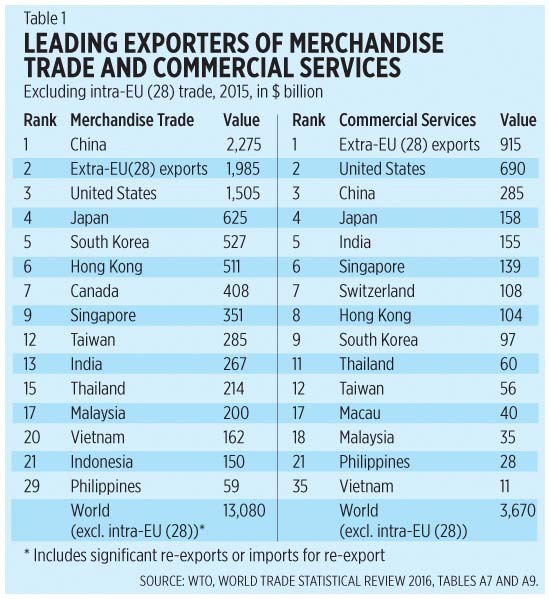 3 Five ASEAN countries are important players in global merchandise trade with at least $150 billion in exports. The Philippines is playing a far catch up with Indonesia and Vietnam. 4 In services trade (including revenues from tourism and business process outsourcing (BPO) firms) many Asian economies still remain part of the big- and medium-size players, at par or even larger than the average European economies. The $915-billion revenues in 2015 is for all 28 EU economies. 5 Within the ASEAN, the Philippines is a medium-size services exporter while Indonesia did not belong to the top 50 in 2015 (see Table 1). 6 In some sectors, the Philippines ranked #10 globally in 2015 in the exports of telecommunications, computer, and information with revenues of $3.5 billion, and #6 in exports of computer services with revenues of $3.2 billion. 7 Of the economic blocs and free trade areas (FTAs) in the world, ASEAN is the third biggest next to the European Union and North American FTA (NAFTA). They are followed by the Gulf Cooperation Council (GCC), European FTA (EFTA), SAARC Preferential Trading Arrangement (SAPTA), and Mercado Común del Sur (MERCUSOR). 8 An expanded ASEAN + 6 (China, Japan, South Korea, India, Australia, New Zealand) under the Regional Comprehensive Economic Partnership (RCEP) will easily overtake both the EU and NAFTA in total merchandise exports. 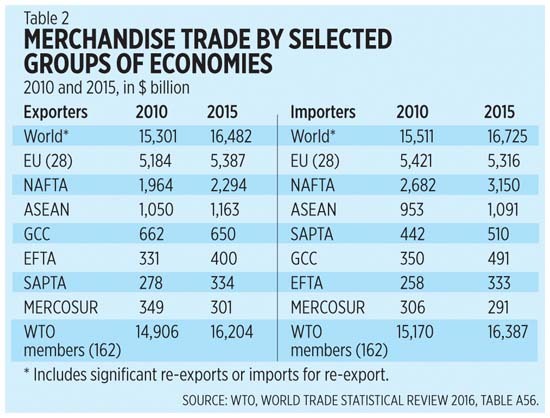 Those six partners are huge exporters except New Zealand (see Table 2). 9 The statement “this is the Asian century” in terms of trade and GDP growth will become true starting this decade. The main factor to sustain this momentum is Asia’s huge and generally young population especially in India, Indonesia, Philippines, and Vietnam, comprising 1.7 billion people with an average age of only 24-25 years old which is one-half of the average age of Japan and many developed countries in Europe. 10 The statement “If America (or Europe) turns protectionist, Asia loses” is wrong. Whoever starts serious protectionism is the loser. Free trade creates good will with other countries while expanding the choices and options for local consumers and manufacturers, which expand their productive capacity. Should Mr. Trump proceed with his campaign promise to ditch the Trans-Pacific Partnership (TPP), it can be good news for other Asian economies that are outside of the five Asian economies that are part of the TPP. They are expected to suffer some exports decline to big markets of the US, Canada, and Japan due to trade diversion from non-members to TPP members. Freer trade and fewer restrictions in the movement of goods and people are becoming the norm in emerging and transitioning economies of Asia than in developed Asia, Europe, and America. 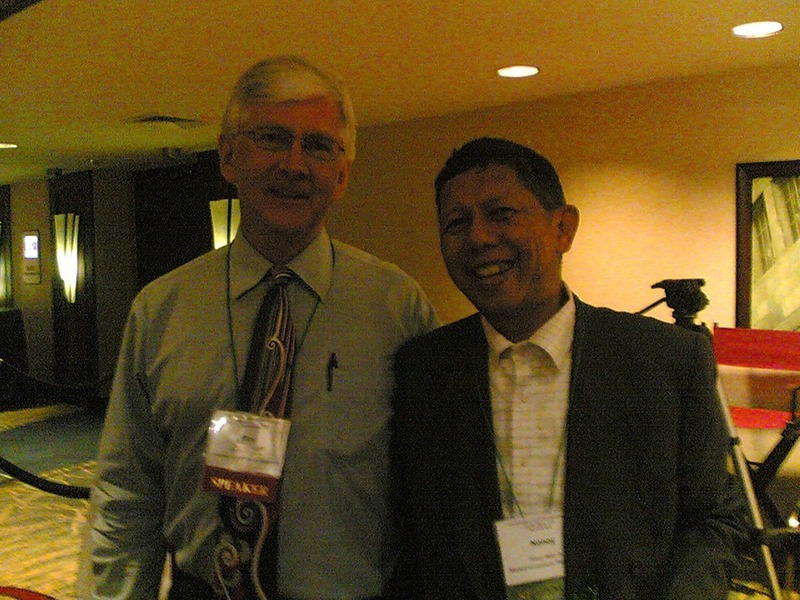 Bienvenido S. Oplas, Jr. is the president of Minimal Government Thinkers and a SEANET Fellow. Both institutes are members of Economic Freedom Network (EFN) Asia. Some PH Senators declared that the Senate will ratify the Paris Agreement of more expensive, unstable electricity "to save the planet" even if the DOE did not concur with it. Portion of the report said, "32 of the 33 agencies having already submitted their certificates of concurrence to Malacañang." The agency or department that did not concur with the PH (actually CCC) commitment to the Paris Agreement is the DOE, thanks Sec. Cusi. “I cannot concur on the ratification of the climate change [pact] because that can be used against DoE in approving the kind of power plants that we are going to have,” he said. Mr. Cusi said the country’s pledge to cut carbon emissions by 70% means reaching a level that has already been met -- in 2015. “What does it mean? Wala na tayong gagawin [We can’t do anything],” he said, referring to curtailing the country’s development." Many big countries like the US, Germany, UK, have not ratified their Paris commitment. Those who ratified are mostly small countries. 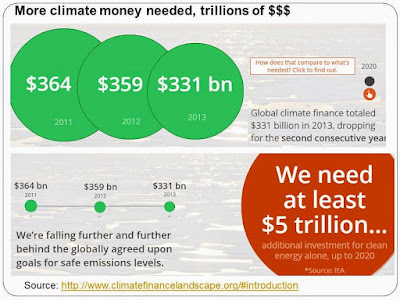 $100 B a year of climate money transfer from developed to developing countries has become a huge extortion project that will produce huge disappointment from beggar countries. Almost ALL developed countries are already heavily indebted, they have huge public debts, don't have enough money for their own citizens. And they will give away huge money to developing countries, many of whom are led by despots and corrupt leaders, will not happen. 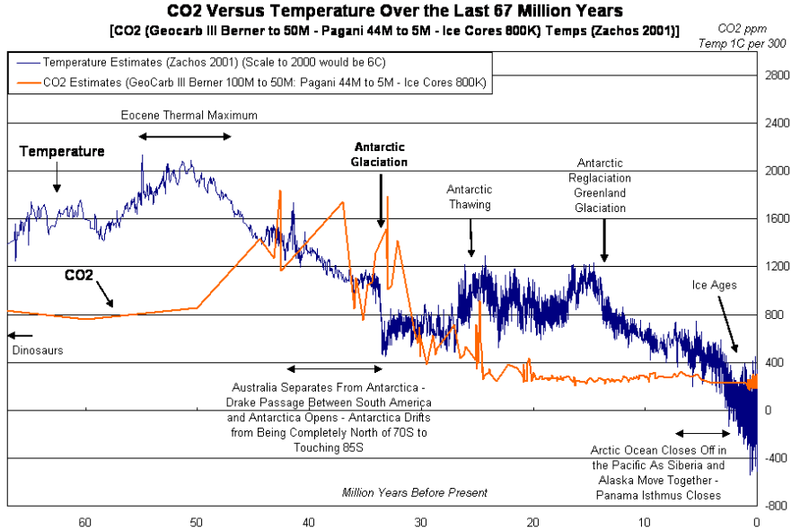 The degree of climate extortion varies. 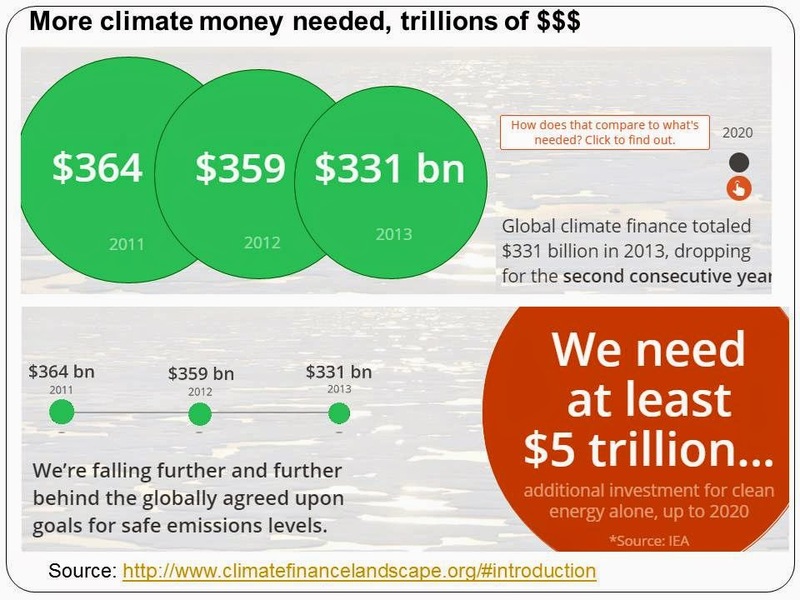 While the "consensus" is $100 B a year starting 2020, some UN officials and planet saviours want $500 B a year. Less flood or no flood or more floods; less snow, no snow or more snow, that money should be given to them. 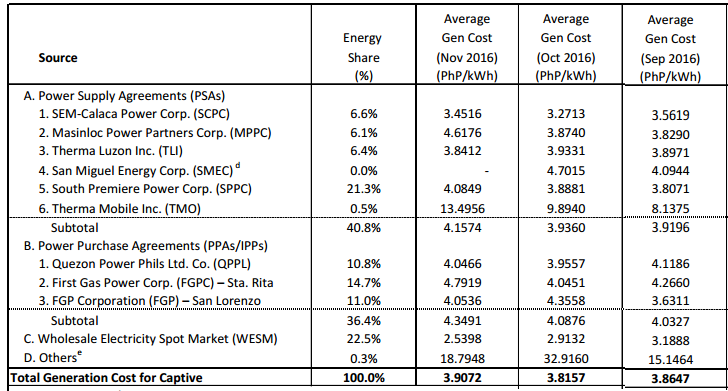 As for energy prices, Meralco generation charges for Sept-Oct-Nov 2016 below. All these power plants are using coal and nat gas, except TMO, a peaking plant that uses oil. WESM prices are cheap, down to only P2.54/kWh last Nov. Which means FIT Allowance will be high so that pampered solar and wind plants at P8 to P10+ per kWh will remain "viable" through expensive electricity imposed on all energy consumers nationwide. Sec. Cusi's energy realism should be supported against energy alarmism by other agencies and groups. * This is my article in BusinessWorld last December 28, 2016. The Roll-on, Roll-off (RoRo) boat system of transporting trucks, buses, and cars from one island to another is among the best inventions for archipelagic countries like the Philippines. Vehicles go inside the boat, passengers come onboard, and the boat travels to another island where it docks, unloading passengers and their cars on the way to their destinations. My first RoRo experience was in the late 1990s when I took the bus from Cubao to Iloilo City. It was an adventure to see for the first time Oriental Mindoro outside Puerto Galera, Panay island from north to south, and the Aklan-Capiz-Iloilo provinces. It was a 25-hour trip because there were few RoRo boats that plied the Batangas-Calapan then Roxas, Oriental Mindoro-Caticlan, Aklan routes. It was exhausting but fun. My second RoRo experience was in 2003 when I traveled by bus from Sweden to Netherlands via Denmark and Germany. Our bus entered a huge boat somewhere in Denmark, the boat traveled to and docked in Hamburg, then we boarded the bus again and traveled to The Hague, where I visited a friend. There was a big difference between the Denmark/Germany and Philippine RoRo system of course. First, since the boats in the former are huge, the vehicles -- once onboard -- aren’t cramped unlike in local boats. Second, waiting time at the port in Denmark was short and didn’t take hours. Last Dec. 21, I drove again like December last year from Makati to Iloilo City with my family, lugging cargo that weighed 300 kilos. Since it was the holiday season, there were lots of travelers who took their cars, unduly extending the waiting time for vehicles to get onboard. Now there are only three RoRo shipping lines plying the Batangas-Calapan route: Montenegro, StarLite, and FastCat. Last year, there was a fourth player, Super Shuttle, and there was a RoRo boat plying the Batangas-Muelle/Puerto Galera route. Both are gone now. In Roxas port, a duopoly, Montenegro and StarLite shipping lines, serve the Roxas-Caticlan route now; last year, there was SuperShuttle as the third player. When I arrived at Roxas port, there were many cars trying to get to the next Montenegro boat while StarLite ticket office was still closed, so I drove one more hour from Roxas to Bulalacao, Oriental Mindoro, to take the Bulalacao-Caticlan route that was served only by FastCat. So FastCat is the third player to serve passengers and vehicles going to Caticlan but it’s on a different, farther seaport. For those planning to try this adventure for the first or second time, here are the costs to bring your car to Panay island. 1. Toll fees: Makati to Batangas via SLEx, SLEx extension, STAR tollways about P320. 2. Batangas port fees: Philippine Ports Authority (PPA) terminal fee for cars P129, for passengers P30/head, children below 12 years old are free. 3. Montenegro boat: P1,920/car (jacked up from P1,500 due to the Christmas season), passengers P192/head, P120/child from 7-12 years old while children 6 years and below are free. Car driver is also free. 4. Bulalacao port: PPA terminal fee for cars P129, for passengers P15/adult, P12/child. 5. FastCat boat: P3,380/car, passengers can take the economy, premium or business classes. The latter is P500/head, P400 for students, P250 for children. Car driver is free but only for economy seat. Upgrade to business class is additional P125. 6. Fuel/diesel, Makati to Iloilo, 500+ kms, depending on car fuel consumption. My pickup consumed about P1,000. I spent a total of P9,000 all in all, one way, from Makati to Iloilo, which is cheaper than flying for four people -- my wife, two kids, and me -- especially in December when fares are high. That doesn’t include the airport terminal fees, baggage check in charges, and taxi fares to and from the airport. So driving a car via RoRo with about 300 kilos of cargo is cheaper. Although long car rides tend to be inconvenient, it was nevertheless fun for my passengers, especially for my two girls who enjoyed the boat ride. 1. Waiting for one or two hours or more outside the gate of Batangas port as there are many cars and trucks queuing to board a boat to Calapan. Cars going to destinations other than Calapan (Abra de Ilog, etc. ), they can go in anytime, no long queues for them. 2. New security bureaucracy at Batangas port. All bus passengers and car drivers must alight and go through a security check along with their hand carried bags, get the signature of an officer, go back to their vehicles and drive to the queue area for the boat ride to Calapan or other destinations. This was not done last year and previous years. 3. The Roxas, Oriental Mindoro municipal government acts like a typical extortionist. It collects P50 for each car entering and exiting Roxas port. Zero public service for visitors because the port and the roads were made by the national government, and it has a share from the various fees paid by the shipping lines. Many local governments that host ports behave this way too. 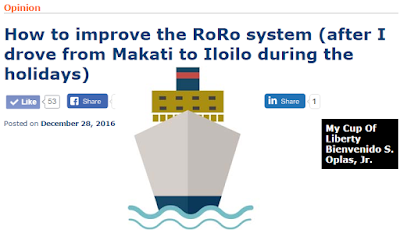 Three possible reforms to modernize the country’s RoRo system are the following. One, consider RoRo system as a bridge, not as a seaport. Allow unhampered movement of vehicles from one island to another as if they are just crossing a bridge and quickly proceed to their destinations. This implies that RoRo development and streamlining be put under the DPWH, not under DoTr. I heard this proposal during the Manufacturing Summit 2016 last November sponsored by the DTI and BOI. Two, allow more shipping lines, more players to serve important routes like Batangas-Calapan, Batangas-Caticlan, Roxas-Caticlan, Sorsogon-Samar, and so on. More routes mean more options for motorists and passengers. Government should reduce the bureaucracies and taxes for new players to come in, or for existing players to expand and modernize their fleet. Three, allow private developers, shipping lines and/or bus lines to put up their own ports, meaning deregulate and demonopolize the PPA.